Dr. Seuss’ How The Grinch Stole Christmas is not only one of the most popular stories by the children’s author, but is one of the most popular stories of all time. Everyone knows the tale of the grumpy Grinch and his dastardly plot to steal Christmas from the Whos of Who-ville, and exactly how it ends; it’s a story that is as timeless as Christmas itself, and contains a message about the goodwill of mankind during the holiday season that anyone, be they child or adult, can relate to. The Grinch himself, however, is popular with most people because he represents a seething cynicism towards Christmas that we all have inside of us – from the overwhelming commercialism to the stressful family appointments to making sure all the food and drink is properly distributed – but dare not make too obvious, lest we be seen by others as – what else? – a grumpy old Grinch. The appeal for adults is evident, but children aren’t as savvy and just see him as more of a colourful grump than an actual representation of something; it is that direction which animation studio Illumination has gone in with their new version of the classic story, which doubles down on what children expect to see from this story, but doesn’t give adults as much to chew on. In case you need reminding of the story, it’s Christmas in Who-ville and everyone is getting ready to ring in the holidays – except for the Grinch (voiced by Benedict Cumberbatch), who hates Christmas and would rather skulk away in his cave, with only his loyal dog Max for company, than socialise with the locals. This year, he’s more annoyed by the festivities than ever, and hatches a plan to steal Christmas from the whole town as they lay asleep on Christmas Eve; but as the Grinch plots his diabolical scheme, young Cindy Lou Who (Cameron Seely) has a plan of her own to meet Santa whilst he’s on his annual rounds, which of course if you know what the Grinch dresses up as to pull off his heist, then you know it’s going to tie into the main plot in some way or another. So far, there have been three major adaptations of this source material; the first was the 1966 animated half-hour special directed by Looney Tunes alumni Chuck Jones and featuring the voice of Boris Karloff, then there was the Ron Howard-directed one from 2000 starring Jim Carrey, and now this one. All of them are distinctly different, from their styles to their overall quality, but each one has shown the appeal of this story to multiple generations – most people will know and adore the Chuck Jones one the most, whilst most people who grew up in the late 90s and early 00s (myself included) have fond memories of the Jim Carrey version, and in the same way my generation enjoyed that version, the newer generation of youngsters now have this new one to fall back on. For them, it’s bound to become a favourite amongst them; it has some very colourful festive imagery, child-appropriate humour, and – as always seems to be the case with an Illumination film, regardless of its quality – contains some gorgeous animation. As a film designed for a specific audience, that being primarily young children, it does its job just fine and doesn’t stray too far from what made the story so appealing to kids in the first place. For adults, however, it’s going to be a bit of a different story. 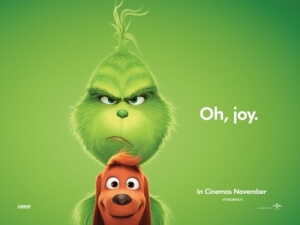 I can already see that critical reaction is quite mixed, with quite a number of people saying that this version of The Grinch is nothing more than an unambitious cash-in that adds very little to the source material whilst also not completely staying true to what Dr. Seuss originally set out to achieve, and while I don’t think I disliked it as much as some of those people, there’s a part of me that understands what they’re on about. This really is just the same story you’ve seen before, only done in a very harmless and all too safe manner which tends to soften the nastiness of the main character so that younger audiences aren’t so put off by him, even going so far as to giving him a tragic backstory that explains why he is the way he is, but in doing so the essential core of the character feels lost in translation. Say what you will about the Jim Carrey version, and I’m sure there’s plenty of things you can say about it, but that film at least stuck to its guns in making the character as consistently grumpy as he’s best known to be, and didn’t always do things that were so out of character like he ends up doing at points in this one. That film also had a bit more of an edge to it, even casting a darker light on the Whos themselves as they’re wrapped up (no pun intended) in all the Christmas commercialism so much that they end up being as despicable as the Grinch himself; here, the Whos are just your generic nice townsfolk, which makes them a lot blander and therefore not as interesting as the Jim Carrey version made them out to be. As for the green grump himself, Cumberbatch voices the character like he’s reading aloud a bedtime story on CBeebies, adopting a campy and rather effeminate tone that might not have been the best fit for this kind of character, but to his credit he does at the very least sound like he’s having fun in the recording booth. It’s a movie that, like the Jim Carrey version, is going to attract a lot of negativity from the Dr. Seuss purists, but young kids will enjoy regardless of what their elders think. This movie was designed for them more than us, just as the Jim Carrey one was designed for us more than our own elders, and just as the Chuck Jones one was made for them when they were young. Either way, no matter what the overall quality is, the sheer timelessness of this story is one that should grow your heart three sizes. The Grinch is a new version of the classic Dr. Seuss story that doesn’t do anything new or revelatory with the source material, but like every other adaptation the children going in to see it are bound to love it more than their elders.